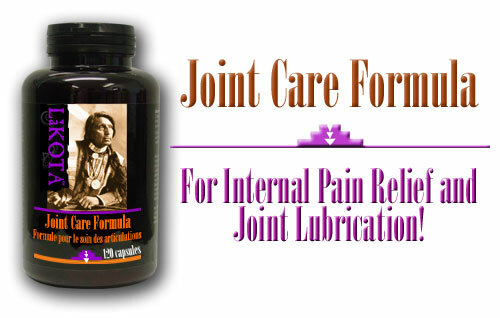 Highly recommended and endorsed by many pharmacists and natural health consultants, the Lakota Joint Care Formula targets three different areas of arthritis at once. First, it provides fast pain relief. In our opinion, this is the number one thing that an arthritis product needs to address. If you don't control the pain then people stop flexing and using the problem joint. This can lead to even more pain and cartilage destruction. By controlling the pain, arthritis sufferers can continue to move the joint. This increases circulation to the problem area which helps bring blood and joint rebuilding nutrients into the joint. The second thing that the Lakota Joint Care Formula does is supply the essential ingredients necessary to help increase joint lubrication. Extra lubrication reduces friction within the joint thereby helping to decrease further cartilage break down. This additional lubrication also helps reduce even more pain. Finally, the Lakota Joint Care Formula provides your body with Collagen Type II. This is the primary ingredient in many scientific studies that is showing the greatest promise for REBUILDING and REPAIRING damaged joint cartilage. Each gelatin capsule contains a proprietary of Boswellia extract, Collagen Type 2, White Willow Bark, Yucca Root Powder, Devils Claw Root Powder, Sarsaparilla, Feverfew Leaf Powder, and Bromelain with Glucosamine Sulfate 150mg, Glucosamine HCL 150mg.